Chandigarh –BJP national secretary Tarun Chugh today said the BJP is banking on nationalism & development while the divided opposition is relying on the questioning the bravery of Indian soldiers and martyrs. 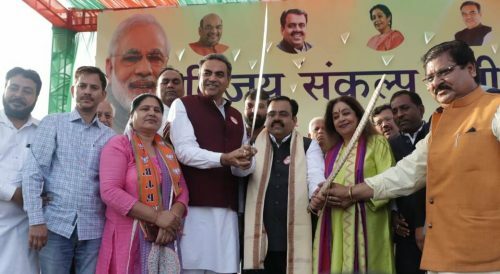 Chugh was addressing a ‘Vijay Jansabha’ organized here by Chandigarh unit of BJP, as a prelude to BJP’s series of 500 election rallies titled ‘Vijay Sankalp Sabha’ scheduled from 24 to 26 of April to be held across the country. Addressing the audience at the ‘Vijay Sabha’, Chugh said the NDA government led by Prime Minister Narendra Modi was committed to its promise of ‘Sabka Saath Sabka Vikas’. The BJP leader said that people at the Helm of affairs in India failed to act against the terrorists in a decisive way for almost four decades but Prime Minister Narendra Modi has conveyed India’s will to both the terrorists and the government of Pakistan. Chugh said under the leadership of PM Modi, it was now a new India, which would not bow before either Pakistan or the terrorists. “The PM has made it clear that India would chase the terrorists to their hideouts and give a befitting reply to them in the language they understand,” he said. On this occasion, MP Kiran Kher welcomed Tarun Chugh & highlighted the developments in the city beautiful during Prime Minister Narendra Modi’s tenure. She expressed pride in being chosen as the first MP from BJP in the city who completed the full five-year term. She further continued that Narendra Modi will be the prime minister again and therefore, we must work towards a unified goal of winning the elections as synchronized state unit. She further stated that agony in the heart of our Prime Minister can only be in the heart of a “Kamdar”and not in the heart of “Namdar”, so we need to make sure that Chandigarh gets a BJP MP once again. On this occasion, National Executive Member and former President, BJP Punjab, Kamal Sharma said that Modi ji has lived in this city for many years, hence the reputation of this city is also at stake. He called upon the party workers to spread the word on the achievements and the development plans in the city, to ensure a phenomenal victory in Chandigarh is going to be achieved. कलश यात्रा में केवल स्त्रियाँ ही कलश सर पर धारण क्यों करती हैं?